Tuesday. Reporting, reporting, reporting. Arghh!! Monday. Another manic Monday infact. I have so much reporting to do this week that I doubt I will get through it but I make my best stab today. The boys get to be lazy at home. I stop off at Sainsbury's on the way home and stock up on supplies for the week. Sunday. A nice lay day really. The boys wake up at the campsite and have a camp breakfast on the gas stove. Wendy and I have croissants - very civilised and then go shopping in Milton Keynes. The array of shops there is excellent but the ambience is very tired, scuffed and old. 1960s and 1970s concrete does not age well. It's all turning into some kind of corboissian nighmare from what I can see. The boys get back from the lake in the early afternoon and we head home around 4pm. It is a pleasant day weatherwise. Things may be hotting up now. Saturday. In which we travel up to Barton-le Clay for the weekend. The boys go waterskiing on the lake at Stewartby and then camp there for the night, in the rain. Wendy and I meanwhile have a curry and spend the evening watching Blood Diamond which is a very good film. we turn in for the night at around 11pm. An early night for me. Friday. Where is the time going? It's not surging away or even dripping away but it's more of a blink and you'll miss it kind of feeling. At work this is Period 1 Week 4 Friday - the first period is over - already - so on Monday the cycle, the reporting cycle that is begins all over again and it fills me with total depression. I've had no respite this period - none whatsoever. I hope it gets better next time. Today the weather was unremarkable. We had a bit of sun, a kind of cool warmth and there were a few showers and a lapping wind. Unreliable would perhaps be a more apt description - three seasons in one day - everything but winter. The floods are receding now in other parts of Britain but the situation is still very grim and those guys had more rain today. There's no such thong as a country idyll anymore and you wouldn't want to touch a riversie property with a barge pole these days even if it was built on stilts. Richard and I watched the film Sideways tonight and I found it terribly sad and ultimately unsatisfying in a Lost in Translation kind of way -only not nearly as bad. I like happy endings -or put it more bluntly I like endings full stop. It was kind of like they ran out of film at the end. Who ends a movie with a knock on the door? More questions than answers. A very loose end. Thursday. I went to Salisbury today for work and very nearly didn't get back. Missed 1 train and then the next was delayed and then it wasn't stopping at Woking so I ended up waiting for an hour or more at Salisbury Station. Didn't get home until after 8pm. Am very very tired. Mark is recovering from his teeth extractions and Adam is now on antibiotics for his infected toe. Oh joy. Wednesday. Heroes day - it started on BBC2 tonight and I wathced it with Mark and Richard . IT is going to be good. I also saw Brothers and Sisters. so much goof TV all of a sudden. Important day for Mark today - he had his dental operation and had 4 teeth extracted this afternoon. I got him chicken soup for tonight as he could only manage soft things. He has been brave. He brought his teeth home in a little plastic box. The dentist has told him to stick one in a glass of coke overnight to see what happens - I'm guessing there won't be anything left in the morning. He is going to have to wiat until we have some more coke before he can tery that little experiment. Adam went to Thorpe Park for the day with friends and certainly got his money's worth - Was there before the gates openned at 9.30 am they stayed until the last ride and left aroudn 7.30. He came home absolutely stuffed with junk food and so didn't want any tea - not even raspberries and icecream and he even went to bed on time tonight - amazing. Tuesday. I'm having a tough time of it at work just now. There's is so much to do and my role is developing and now I will be assigning some of my duties to others so that I can take on new challenges - it all sounds great but how am I going to find the time to do an effective handover. I will and it will pass. I was too tired tonight to read very much of Harry Potter - I fell asleep in Chapter 5 and I am sure it is good. I did get all the washing done tonight though and hung out. I keep abreast of the washing and the cookign but the cleaning is suffering - I do need to find another cleaner. I will have to put my feelers out. Monday. Very busy at work. Adam and Mark enjoyed their first day of summer freedom - not that it was very summery. Still som any shocking pictures coming in from places like Tewkesbury and parts of Worcester. 350,000 people without fresh drinking water. adn lots without power too. I can't imagine what it must be like - quite devastating. Sunday. Shocked by all the floods in Gloucestershire. Quite devastating - yet we had a reasonable day here - it was sunny. Quite bizarre - found it hard to tear myself away from News 24. I'm a bit of a rubbernecker sometimes. Didn't read any more of Harry Potter today. Too much on my mind. Saturday. Another rainy day - showery day. I attempted to hang out my white wash to dry in a period of intermittent sunshine but it didn't last so I ended up having to hastily bring it in again and everything had to be left to dry indoors again - not what you expect for summer. Lots of pictures on the news of the flooding all over England and parts of Wales - not good for some. 10,000 people stranded in their cars on the M5. The RAF assisted with many dramatic rescues in Gloucestershire and so on. Thank goodness we live at the top of a hill. If we ever get flooded then most of England will be a gonner so I can't see it happening. In contrast parts of central Europe are having a very very hot spell. I read in the paper that they expect that our summer will come in Spetember/October - great - when all the winter woollies will be in the shops. I started reading the new Harry Potter today - my copy came from Amazon via Royal Mail when I was out having my hair done. I've read three chapters so far - and much of it has been in italics. Adam has been steadily working his way through the 608 page tome over the course of the day. The rest of us watched Dodgeball - it was on Film4 but we swapped to DVD to avoid the adverts - Adam didn't surface. I think it has been a pretty much Runescape free day for him - he will likely finish the book some time tomorrrow when normal teenage angst service will be restored. I'm making the most of the calm - there's nothing deathly about that. Friday. Phew what a stormer. We had a cloudburst this morning in Woking the like of which I have never known. It rained heavily for about 2 hours. It was unrelenting and the thunder was so loud it felt like explosions were going off in the sky. Talk about the force of nature. Anyhow it eventually passed leaving severe flooding in some parts in its wake. Mark and Adam broke up for the summer holidays today and they got absolutely soaked walking hoem from school. When I got back from worj later in the evening each boy had left a soggy by now steaming pile of wet school clothes on their respective bedroom floors. Richard and I went out to see Gavin and Claire tonight in Yately. I did one of my famous left-overs teas tonight whereby we all had a different left-over meal from the freezer. Adam and Mark ahd pasta and then Adam had a curry because they both wanted the large portion of avaialbel pasta. Richard had a lamb steak with new potatoes and beans and I had a roast chicken leg with onions and potatoe wedges. We got to meet baby Arwen Emily. She is six month old now and was quite lovely. At midnight the final Harry Potter book was being issued around the world. My copy was ordered months ago via Amazon and should arrive tomorrow morning but Richard took Adam out to Sainsburys at midnight so he could purchase one of his own which duly he did - I thnk he read the first two chapters before turning in. Thursday. How can it be that I am 200 days into this year now? Incredible. How can it be that the boys break up tomorrow for the Summer Holidays? Amazing. The year is slowly washing away. The summer being a total washout so far. It is predicted that tomorrow is going to be Wet Wet Wet. Flooding is forecast. We live at the top of a hill so if we get flooded then everyone else will be in a lot of trouble. You can tell it is summer - there is nothing to watch on TV. I even resorted to wathcin a DVD tonight. We saw "A Night At The Museum" which wasn't great but did have its moments - most of them involving Owen Wilson. Wednesday. I did remember Laurence and Lydia's birthday today -sent cards and money - just didn't get round to phoning. Bad Auntie - I'll give them a ring at the weekend - I ws quite exhausted after my travels today. I went to Richmond in the morning and then Kingston in the afternoon and then home via Surbiton It was like Planes, Trains and Automobiles but without the Planes. I watched Brothers and Sisters tonight - the one I watched yesterday and the new one - sooo good - I can watch it again and again - I just love it. Tuesday. Most memorable event was chasing Adam to get his Geography Coursework project completed to be handed in tomorrow. As predicted by myslef - because mother knows best as ever - it took far longer than he had anticipated. It was well gone midnight before he got to bed bit at least it was job done. I also did the washing and hung it up indoors. You can't trust the weather at all these days. The sun has goen AWOL and rain is the order of both the day and night -showery that is from time to timebut always the imes when I want to dry my laundry. Arghh!! Monday. woke up to the sound of heavy falling rain and the knowledge that 3 loads of bed linen and towels washing was hanging on the clothes line getting soaked - should have brought it in last night. Left it hanging soaking when I went to work. It was dry when I got home - rain is a good fabric conditioner I try to convince myself - for everything apart from the face clothes that is - which came off like plywood boards. Oh well. Sunday. On which I manage to do the downstairs cleaning and wash all the towels and bed linen. Run out of time for doing the upstairs cleaning however. Will have to try and do this on Tuesday night if I can but this is doubtful. We had a family trip to the cinema this evenign to see Harry Potter and the Order of the Phoenix. Excellent but very dark. Harry, Ron and Hermione are all looking very grown up now and I can't help thinking they will not look like school kids any more by the time the last film comes out. It is only a matter of days now before the final book is released and I have already ordered my copy. Saturday. Recovery day on which I manage to do 5 loads of washing and hang them all out on the line to dry and take them all in again. This was pretty much all I did today but have washed all the family's holiday clothes . We also have a barbecue which we eat al fresco - albeit in my case with a fleece on. I preferred the summer in Rome. Mark returns later having enjoyed sailing and the rat run and this time a first, having not lost a single item of clothing - even the belt which was safely stowed at the bottom of his hold-all. He did however return with what seemd like half of Newquay beach and various brown stains on his tee shirts etc that we could well have done without ,not to mention copious sticks of sickly rock. It is good to have them safely back and happy and seemly pleased to see us. The family reunited!! We indulged in an inpromptu chinese meal from Sainsbury's. Will have to return to proper cooking tomorrow night - I feel a barbecue will be called for - weather permitting of course. Thursday. Roman Holiday Day 3. The Vatican., St Peter's Basilica and the late flight home. Wednesday. Roman Holiday Day 2. Ancient Rome. Monday. Adam and Mark embark on their respective school trips today. Adam leaves for Paris at 20 past 7 - Richard drops him off at the school and Mark goes off to Newquay at 7.45am - I drop him off at Ali's. Richard and I have one day at owrk and then we have to pack up and be ready for Rome. I get us an indian takeaway meal for 2 from Sainsbury's tonight. It is more like a meal for 4 actually. We then spend the evening packing and try to go to bed early. It is still gettign on for midnight when I turn off the light and my alarm is set to go of at 2.30am. It is goign to be a long day tomorrow. Sunday. 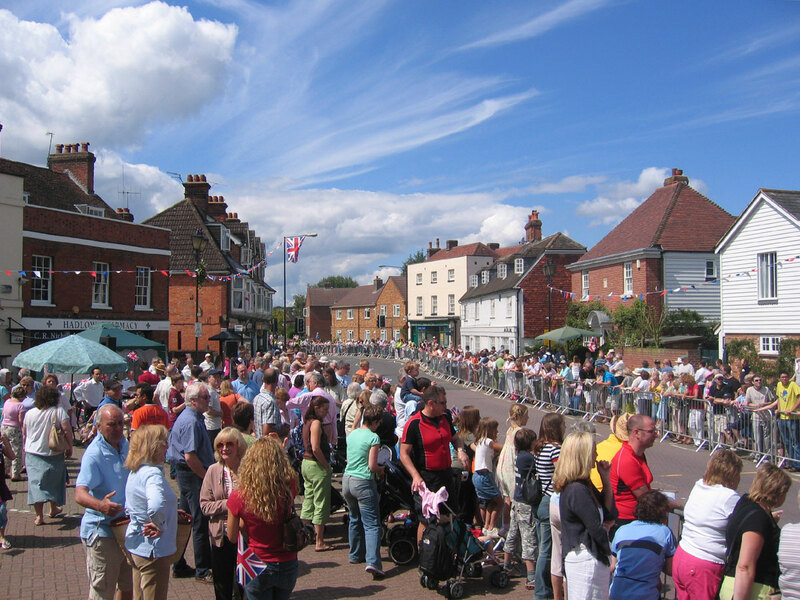 The Tour de France passes through Hadlow village. What an amazing day. Thursday. Barney was back in work today and spent much of the day in Woking which was good. Baby is called Benjamin Connor - Barney is a very proud Dad. Tomorrow is the Management meeting and ball. Treated myself to some new underwear tonight and am very pleased with my purchases. Wednesday 4th July. Alan Johnson was freed today - wonderful news - after 114 days in captivity, held hostage by some unpleasant Palestinian fundamentalist jehadi type group in the Gaza Strip. Tuesday. what a stormer of a day. I have never seen rain like it. Rain mixed with hail. I came out of the hopsital in Guildford this afternoon and had to shelter fro tem minutes in the entrance way before I dared to walk down Jenner Road back to the office. The road was like a river , a torrential river. It was quite amazing. Then later driving home from Woking Town centre in the evening the heavens opened once again and it was yet more heavy heavy rain, mixed in with hail - it was scary stuff trying to drive through it I can tell you. Monday. Well that's it - we are just on and past the mid-way point for the year today. 2007 is half over already. It was new starter day at work and I am exhausted - I had so much to do today - too much really. I didn't get everything done, not by a long shot. Tomorrow I have to go to Redhill and I have to go to the hospital for physiotherapy and I have a meeting in the Guildford office. And on top of all that I have to get on with the Period end reports. arghh it never ends. I even took work home tonight so that I didn't fall too far behind. I am going to need my trip to Rome next wek. Sunday. Where has the summer gone. It's the start of July and it is like we are still waiting for procedings to commence. It's cool, mainly cloudy and frankly just not summer. It was not a busy day today. I did very little really. Richard took Mark to see Pirates of the Caribbean 3. I didn't really fancy it. I did some washing and cooked a large toad in the hole for tonight's dinner. Read the Sunday papers. The calm before the storm, it is going to be an impossibly busy week ahead. Visitors on Tuesday. Management Ball on Friday. Tour de France on the weekend and somehow getting 2 boys ready for their respective school trips next week. I do hope that the weather improves or else they could have a pretty miserable time.